Damn Arbor: Where is the best neighborhood fireworks display? Where is the best neighborhood fireworks display? Apparently all of our file photos of fireworks images were actually Vines and they disappeared. 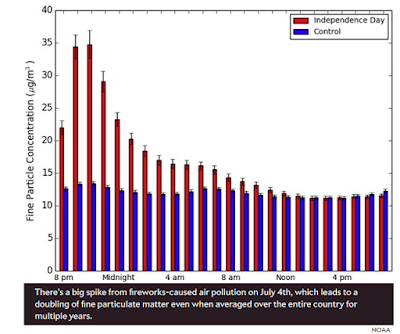 Here's a graph showing fireworks related air pollution from our good friends at NOAA. A new Ann Arbor resident asked /r/annarbor where the best local fireworks display is. The days of Ann Arbor's municipal fireworks show ended long ago and the discussion centered around which neighborhood has the best unofficial fireworks show. According to the redditors suggested Hunt Park and Burns Park have good fireworks displays on the 4th. I know there's usually a good show at Maryfield Wildwood Park on Ann Arbor's west side too. Gentle readers, where are your favorite neighborhood fireworks shows? Are there any in Ypsilanti? Since we are living in this libertarian-fireworks-hellscape, we might as well enjoy it, right? Mine, of course, in Ann Arbor Hills. Would you expect anything less? Sparkler in a Dimo's donut. Micro-neighborhood. Dave, we call them microhoods now. "But my dog hides under the couch and pees for 3 days!"